Ointments are thick, oil based products that form a layer on the surface of the skin which is very effective at trapping water. However, they are not easily absorbed and can be messy. Ointments are normally supplied in tubs which can be inconvenient to use. A clean spoon or spatula should be used to remove the ointment from the tub into a clean disposable pot before applying it to the skin. Putting your fingers directly into the ointment tub may lead to the ointment being contaminated. Gels have a high oil content mixed with water. Gels usually contain humectants, such as glycerol, to help trap water in the skin, and some may also contain ingredients to make them very long-lasting. Some gels, such as Doublebase Dayleve Gel may only need to be applied twice a day, to provide effective hydration. Gels are easy to apply and are often referred to as being cosmetically acceptable, because they are quickly absorbed into the skin. Gels are usually supplied in pump packs, which are more hygienic than open tubs, and also in tubes for convenience. Creams have a medium to high oil content mixed with water. Some creams may also contain a humectant, such as glycerol or urea, to help trap water in the skin. Creams are easy to apply, and are sometimes referred to as being cosmetically acceptable, because they are absorbed into the skin. Creams are usually supplied in pump packs, which are more hygienic than open tubs, and also in tubes for convenience. Creams usually need to be reapplied regularly throughout the day, often up to three or four times, because they may be easily removed by sweat, washing or rubbing. Lotions have a low oil content mixed with water and are generally not as moisturising as ointments, gels or creams. They soak into the skin quickly and they are easy to apply. Because of the low oil content lotions may require more frequent application. Lotions are usually supplied in pump packs, tubes or bottles. 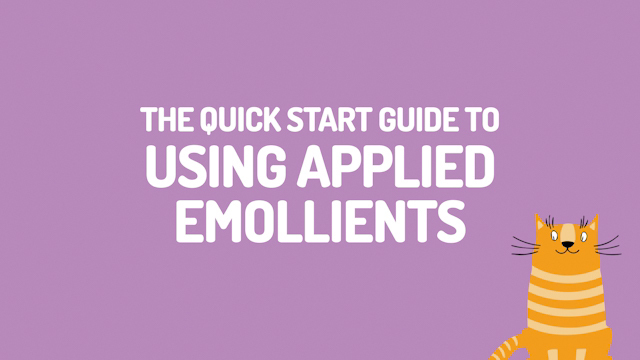 For best results, it is important to use emollients in sufficient quantities. NICE recommend between 250g and 500g of emollient are used each week on children with widespread atopic eczema.1 Emollients are often supplied in 500g packs but some are available in 1kg pump packs. DO use moisturisers/emollients generously and regularly, to improve the condition of the skin and to help reduce itching. The more the better! DON’T scratch itchy skin if you can avoid it, as this causes further skin damage. DO try to find suitable emollients for your skin with your nurse’s or doctor’s help. This may be a combination of cream, ointment, lotion or gel emollients, depending on how dry your skin is and which you prefer to use. DON’T vigorously rub the emollients into your skin. DO smooth the emollient gently onto dry skin. Use gentle strokes in the same direction as hair growth (like stroking a cat or dog). This avoids blockage of the hair follicles. DO apply sufficient emollient so that the skin looks shiny. Allow time for any excess emollient to soak in, if necessary. DO apply emollients, immediately after a bath or shower, as this helps to trap moisture in the skin. Pat the skin dry before applying the emollient. DO remember that exposed areas such as the face, neck and hands may need more frequent treatment. 1. National Institute for Health and Care Excellence (2013). Atopic eczema in children (QS44). London: National Institute for Health and Care Excellence.